While colors will come in and out of popularity, the tricks on how to use those colors will stay the same. Learn where to place an accent wall, how to integrate multiple color tones, and get ideas for patterns and colors in your new home. 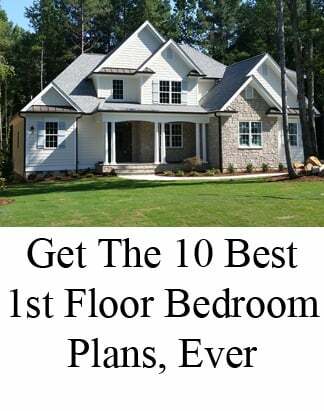 When you're looking up at a two story wall, it will feel more aesthetically pleasing if there is trim, art work, or an accent piece placed roughly two-thirds up a wall. 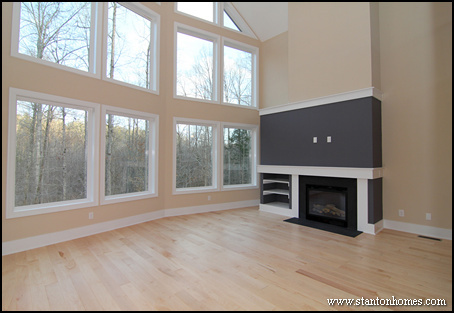 In this Raleigh custom home, an accent color topped with white trim delineates an entertainment center, giving your eyes something to focus on in this expansive, window filled room. 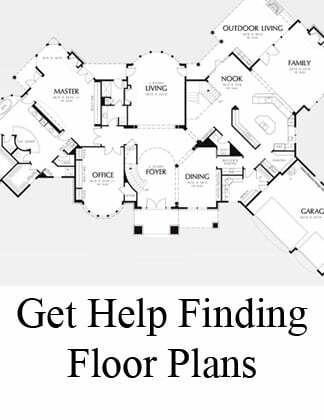 Get more tips on how to design and decorate two story rooms here. 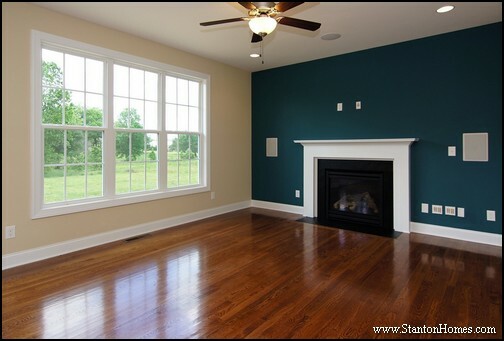 You'll have much more flexibility when picking accent colors than primary wall colors. 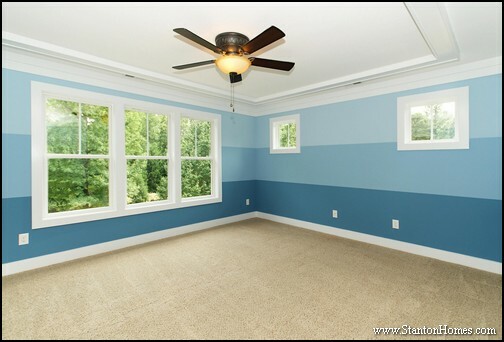 While your main wall color should be flexible enough that it can go with - and enhance - many other colors, the sky is the limit for an accent wall. Love a shades of blue? Add a dark accent wall in the living room, and use a tile back splash that feature blue tones in the kitchen. While wainscoting is generally talked about as a lower wall treatment found most often in formal dining rooms and bathrooms, painted wainscoting designs that span the full height of the room are becoming more popular. Shades of grey have been hugely popular for the past several years, popping up as a motif in million dollar homes, contemporary designs, and craftsman style lodges. 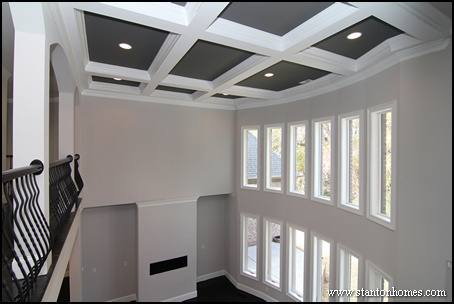 In this luxury custom home, a light grey coats the walls, and a dark grey makes the ceiling pop against white beams. Consider adding a splash of color to an alcove, nook or art space. These spaces are small, and can be easily repainted, so you can use a trendy splash of color without hesitating. Formal dining rooms are a favorite place to add an accent color, distinct from the rest of the home. 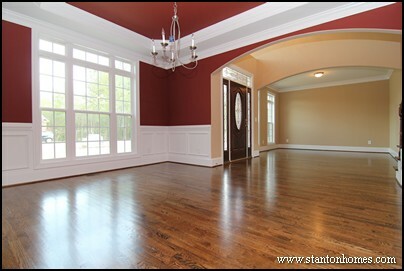 Red formal dining rooms are very traditional, and a frequent request in Raleigh custom homes. A painted ceiling will draw your color upwards - and give the dining room a more distinct space. Dark walls will create a more intimate feel in the master bedroom - especially when paired with ample natural light coming through your private back yard. 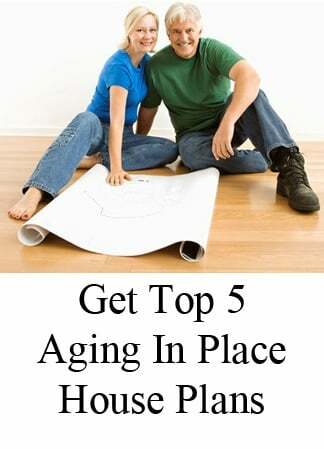 If your primary house paint color is a neutral beige, consider a warm tan or brown for the master suite. 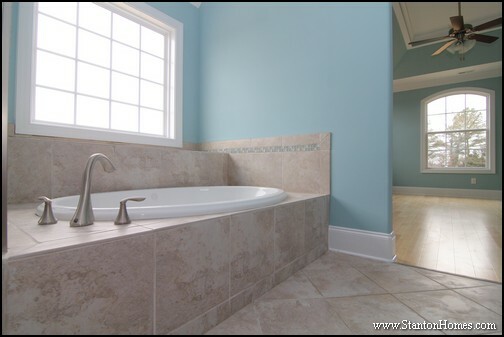 Blue is associated with images of freshness (clean water) and goodness (blue skies, blue ocean, delicate Robin’s eggs), which is probably why it is such a commonly used “go to” choice for the master bathroom. Blue and white as a color combination is as traditional as black and white, and in terms of decorating, the combination of blue and white boasts an even longer history. And a blue and white master suite will distinguish your personal spaces from the rest of your home. 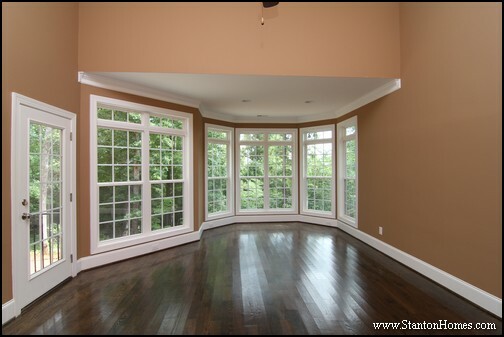 Find a neutral shade you love, and use it throughout your home. Then, find a color one or two shades darker on the same pre-made color strips. 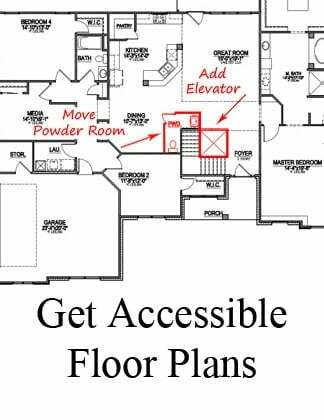 Add the darker colors in accent areas. 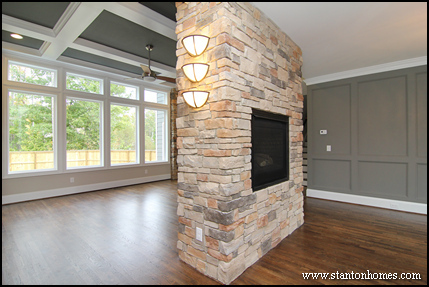 Two-tone accent walls can add dimension to your home. The key to incorporating an accent wall is to find ways to incorporate the same colors, textures, or tones in other rooms throughout the home. 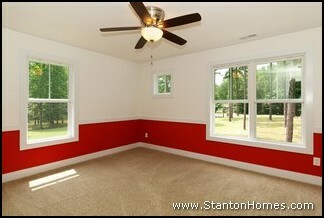 If you decide on a red formal dining room, consider adding a stripe of red in a kids bedroom or game room. Three shades of a soft blue paint give a beach-house feel to this Raleigh craftsman home (the square windows are a customary craftsman feature). 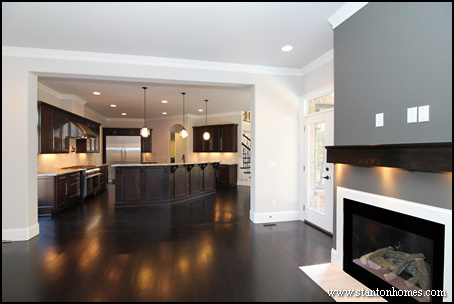 The color black is cropping up in new ways in 2014 NC new homes - as a paint pigment, fixture finish, tile tone, and kitchen appliance color. The use of black makes a strong statement, as a color associated with luxury, elegance, and sophistication. 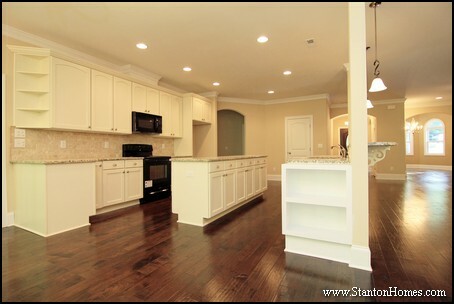 See photos and get tips on how to add a touch of black to your NC new home, here. 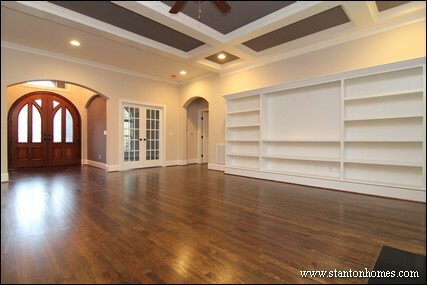 Most top designer blogs are boasting the benefits of black walls, ceilings, and doors. 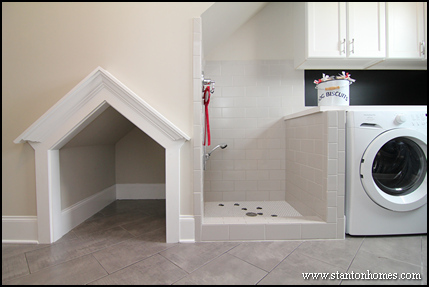 In this mud room / laundry room / dog room combination, two walls are painted in a black chalk paint, designed for grocery and to-do lists. Adding carpet is a great way to add color, texture, and warmth to a space. While you may want to stick with soothing carpet colors for your bedrooms - such as neutral patterns and cream designs - black carpets can make a statement of elegance in smaller spaces. 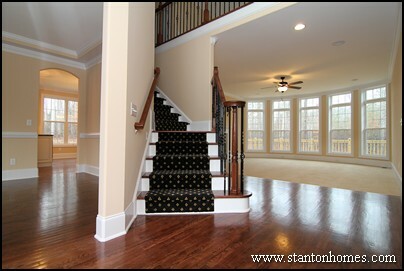 In this version of The Summerlyn, a black patterned carpet runner was added to the hardwood staircase. The bold black color stands out against creams, beiges, and browns. 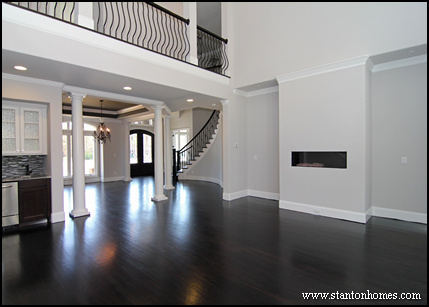 In more contemporary home styles, buyers are choosing wood stains in with an ebony (ie very dark brown to black) finish. 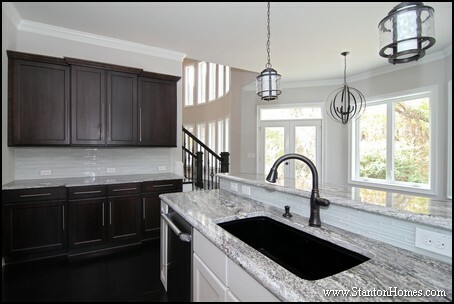 There are many ways to integrate black features and finishes into your custom home kitchen. 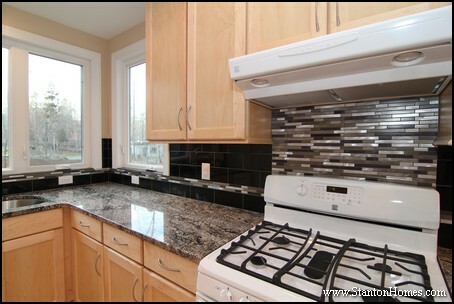 The three most popular places to add a splash of black are the tile back splash, granite counter tops, and appliances. We're seeing more black tiles within kitchen back splash selections - as a brick lay splash and as accents within a multi-tone mini mosaic design. 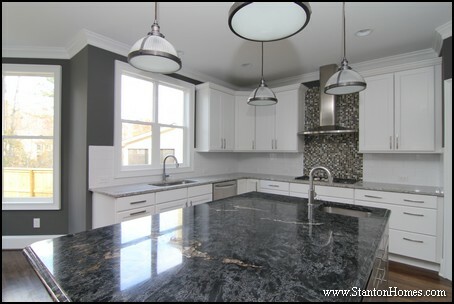 Whether the granite has a black pattern or solid black composition, black kitchen counter tops are popping up in more custom kitchens. While white sinks are popular in farmhouse and rustic kitchen designs, black sinks are a top request for contemporary and modern designs. Even though black appliances tend to cost a bit less than stainless steel appliances, some home owners are choosing them based on their color - not their lower price tag. Especially in all white kitchens, black appliances are making an appearance in more 2014 custom homes. 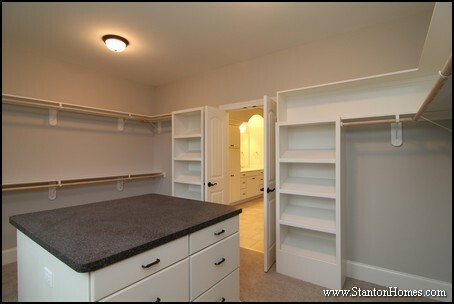 A black counter top in this master closet island draws out the black knobs and levers throughout the master bath. 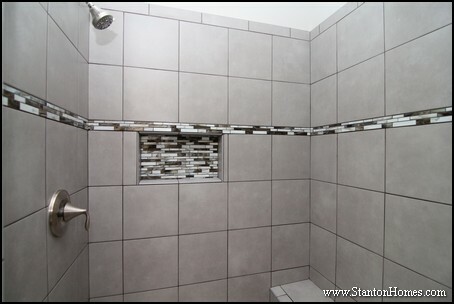 Similar to the kitchen back splash, black tiles can be blended into a tile shower or tile bath. Secondary rooms - such as the powder room - are great spaces to integrate black features. 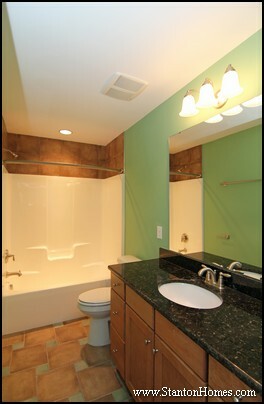 In this secondary bath, a black granite pattern contains speckles of brown - used to tie in the cabinet and tile colors. 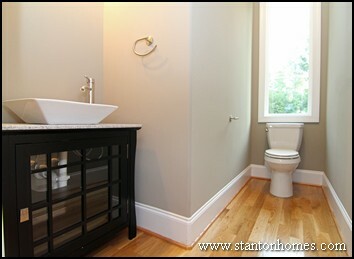 A contemporary black vanity with glass front gives this powder room upscale appeal. 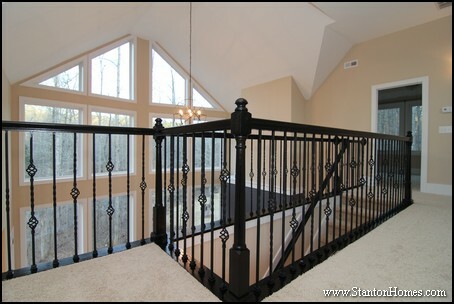 If you love light maple wood floors, consider paring them with ebony or black staircase railings. 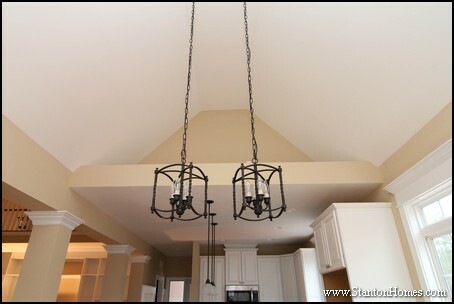 Black lighting fixtures can be added to any room in your home - for a subtle touch of elegance.